I use a Joby GorillaPod with magnetic feet. It's small and quite portable. Works great to attach my S95 to just about anything, including car hoods! I've got this one (I have the non-quick release version) . Works great. GorillaPod for my S100 with quick release head. Ultra pod, small and versatile. I have the Ultrapod II and Gorillapod SLR with ballhead for my cameras, and I much prefer the Gorillapod. The ballhead is great and well worth the extra cost. My Ultrapod II now has weights glued to it and is used with my underwater camera. small enough to stay on the camera at all times, which means you have it with you when you need it, and cheap. 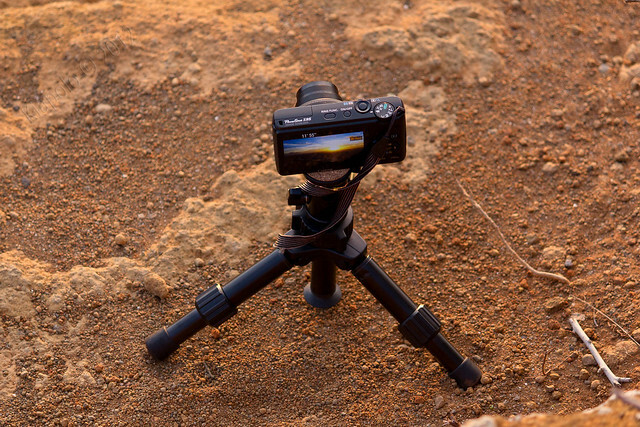 I like the tiltpod, it's always with the camera, very versatile and only $15! I love this. It's always on my s100. A Gorillapod is great to have-own 2 and also I like using a Slik Mini II tripod with my S95. Canon cameras: PowerShot S95, SX20 IS, EOS 1100D (T3) & 300D.